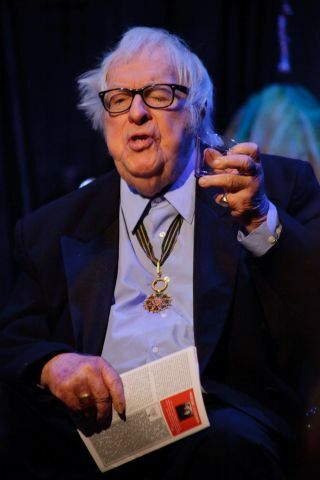 Science fiction icon and author Ray Bradbury died at 91 on June 5, 2012. Science fiction icon Ray Bradbury left an indelible stamp on both science and fiction with his work, say authors and researchers responding to news of the icon's death yesterday (June 5). "When I was teaching English and trying to get kids passionate about reading, the most effective weapon I had was 'The Martian Chronicles,'" said Jack McDevitt, author of the Nebula award-winning "Seeker." Scientists recalled being equally influenced by Bradbury's worlds. "I was a product of the Apollo days (Apollo 11 happened the summer before I entered 11th grade), when spaceflight was still very much the realm of the unknown," said Jim Zimbelman, Mars researcher at the Center for Earth and Planetary Studies at the Smithsonian Institution's National Air and Space Museum. "Books by Bradbury (plus Asimov, Clarke, and Heinlein, to name some of the other 'biggies') stretched my growing mind to think beyond just the obvious or the 'likely possible,' and to embrace what possibly might be 'out there.'" Among his celebrated qualities, Bradbury's originality and inventiveness especially stood out. Nichelle Nichols, actress who played Uhura on the original "Star Trek" TV series (‏@RealNichelle): In honor of Ray Bradbury's passing why not take time out to read one of his marvelous stories? Such a SciFi Icon! A true genius! Phil Plait, astronomer and author of the "Bad Astronomy" blog ‏(@BadAstronomer): The transit of Venus and Ray Bradbury's death are reminders of the transience of beauty, and humanity in exploration.